There’s no better way to kick of the month of December than with a fun Holiday Party look! I’m always one to opt for a dress, but today I’m breaking the mold and pairing this full festive skater skirt with a cropped sweater, metallic belt and suede OTK boots! And since we can’t really get away with not wearing a coat anymore I broke out this old favorite faux fur and leather coat from the back of my closet as the final finishing touch. 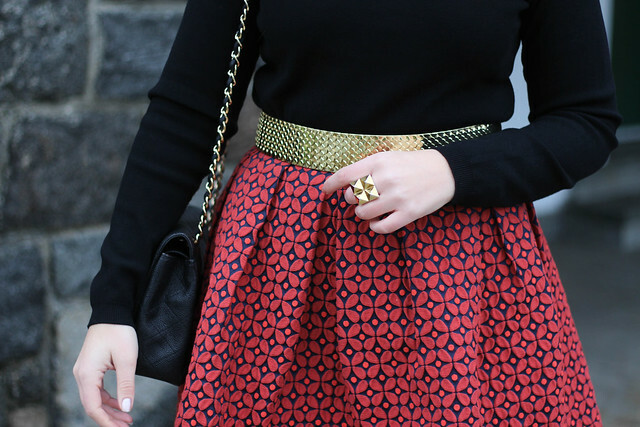 This puff skirt is the definition of a party skirt and the festive print makes it perfect for the Holidays. I’m envisioning twirling around the dance floor, Holiday cocktail in hand Santa hat on my head in this look (note to self: plan Holiday dance party). I apologize in advance for the overload of red, green and metallic clothes and makeup that will take over my blog in December, it’s just too fun not be festive!